This report covers primarily lithium carbonate and lithium hydroxide, with additional data on lithium chloride, lithium bromide, lithium metal, organolithium compounds such as butyllithium, and lithium hypochlorite. Lithium is sourced by evaporation and concentration of lithium-containing brines or from metallurgical processing of hard rock lithium-bearing pegmatite deposits, mainly containing spodumene. Brine from salt lakes in Chile, Argentina, the United States, and China dominate lithium raw material production by source in 2017. The majority of Australian ore, mostly spodumene, is shipped to China as unconcentrated ore for conversion to lithium carbonate. Batteries in general, and rechargeable batteries in particular, are the leading market for lithium compounds. During 2013– 17, global lithium consumption increased at nearly 9% annually, with growth of more than 19% per year forecast over the next five years. The main driver for this growth in demand has been lithium-ion batteries (LIBs) for electric vehicles (EVs), including battery electric vehicles (BEVs), hybrid electric vehicles (HEVs) and plug-in hybrid vehicles (PHEVs). Consumption for this market has increased at double-digit rates over the past four years to surpass that for rechargeable batteries in mobile devices (cellphones, laptop computers, toys, and power tools), formerly the largest battery market. Governments globally have introduced incentives to encourage individuals and business fleets to buy EVs in an attempt to move the technology forward and to reduce emissions from internal combustion engines (ICEs). China soon entered the EV market, and quickly became the largest producer and consumer of EVs. In 2015, Chinese car brands began competing with the Japanese, South Korean, European, and US brands on the market. Vehicle producers, battery producers, and cathode producers are continually striving to improve battery energy, size, weight, and safety, as well as reduce the price to make EVs more affordable. 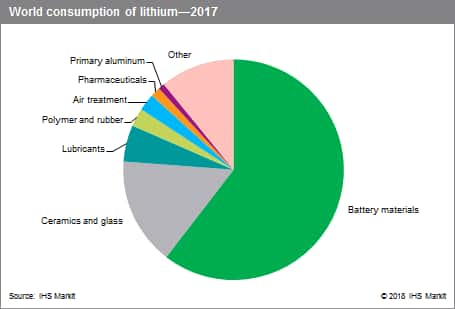 Historically, lithium produced from mineral-based sources was consumed primarily in technical applications, while production from brines was consumed primarily in chemical applications. Over the last two years, China has increased production of lithium carbonate and lithium hydroxide using concentrated or raw spodumene ore imported from Australia, mainly for lithium battery material production. The chemical market is now dominated by lithium battery material production. Lubricant greases, primary aluminum production, air treatment as an absorbent and desiccant, continuous steel casting, initiator in rubber and thermoplastic applications, pharmaceuticals, and aluminum-lithium alloys in aerospace applications are other chemical markets for lithium. The leading technical applications include the glass, ceramic, and metallurgical industries, where its low cost and inherent benefits of having alumina and silica content make it the product of choice. The projected growth in battery applications led to continued investigation into lithium resources and reserves during 2013–17. Capacity has increased at more than 14% per year on average over the last five years, and is forecast to grow at more than 27% annually during 2017–22, as current and new producers expand capacity to meet demand over the coming years. Brine deposits are being investigated and developed in Argentina, Bolivia, China, and the United States. Mineral deposits are being developed in Australia, Canada, China, Finland, and the United States.